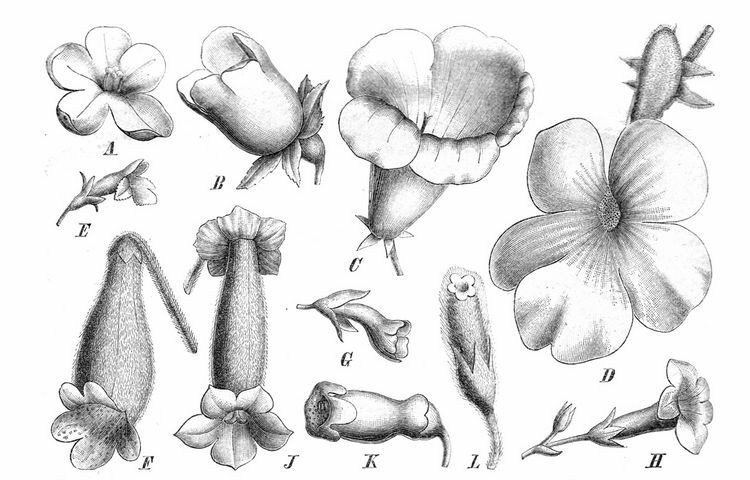 The flowers of Gesneriaceae principally consist of four whorls of flower organs: sepals (calyx), petals (always fused to form to a sympetalous corolla), one whorl of stamens, and 2 carpels (always fused to form a syncarpus pistil). The tubular “water calyces” of Aeschynanthus provide a moist protective environment for the developing buds. The calyx consists of five sepals which are either free to the base or fused to a variable extent. Normally, the sepals are of ± equal size. Bilabiate calyces result from a different extent of fusion and/or different size of the three upper and two lower sepal lobes. In Trisepalum (now sunk in Paraboea, Puglisi et al. 2011) the three upper lobes are almost completely connate while the two lower lobes are nearly free, so that the calyx appears to be trimerous. The shape of the sepals is usually simple (ovate, triangular, linear, etc. ), the margin is entire or sometimes dentate or serrate. Peculiar pectinate sepals are found in some species of Columnea (e.g., C. incredibilis). 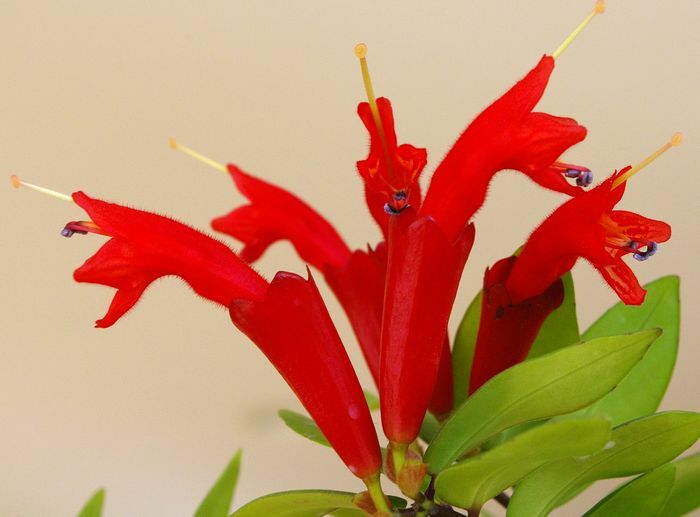 The calyx is usually green, but may be vividly coloured; especially in ornithophilous flowers, either being of the same colour as the corolla (e.g., bright red calyces in Aeschynanthus spp.) or making a conspicuous contrast with the corolla (e.g., species of Columnea, Drymonia, Paradrymonia, etc.). Remarkable are the tubular “water calyces” of Aeschynanthus spp. in the Old World tropics and Chrysothemis in the neotropics. They are filled with a slimy secretion of the sepals, possibly mixed with rainwater. The flower buds develop within this “water bath” and thus get protected against desiccation. The corolla usually consists of five fused petals (4-merous corollas are rare, e.g. Ramonda nathaliae, Oreocharis sinensis (the erstwhile Bournea sinensis, Möller et al. 2011a), Championia reticulata). The corolla exhibits a wide range of forms resulting from the different proportions and shapes of the tube and the limb. There is practically a continuum between flowers with a tube more than 10 cm long and those with almost none (sometimes even within a single genus or section). The tube may be narrow, gently or abruptly widening, pouched on the ventral or dorsal side, straight or curved. Some taxa have a sac or spur at the base, either dorsally (e.g. Gasteranthus, Sinningia, Nautilocalyx, Episcia, Achimenes spp.) or ventrally (Stauranthera). The spur may hold nectar, but may also represent a structure giving strength and balance to a long-tubed flower. The limb is primarily bilabiate, with two upper and three lower lobes, but there are also cases in which four lobes form the upper lip and the fifth the lower lip [e.g. Columnea, Calcareoboea (now sunk in Petrocodon), Allocheilos]. Resupinate flowers (with upside down orientation) occur in Senyumia, in Glossoloma, and in many species of Nematanthus. 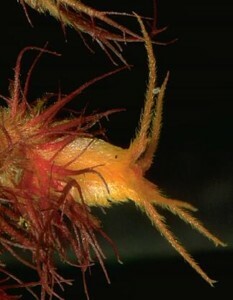 Columnea incredibilis has an extremely fimbriate calyx, as well as highly elaborated rod-like corolla appendeges emerging from between the lobes. A regular (radially symmetrical) limb can be sometimes found in tubular flowers (e.g. some species of Cyrtandra, Kohleria and Sinningia), but more often in short-tubed, campanulate or flat-faced (“rotate”) flowers. Actinomorphic corollas often have five stamens. The corolla lobes are usually rounded, less commonly pointed or fimbriate. Some species of Columnea sect. Ortholoma bear conspicuous rod-like or filiform appendages below the sinuses (e.g. C. minor, C. moorei) or on the dorsal side of the corolla lobes. In C. incredibilis the appendages are up to 38 mm long and completely replace the 3-4 mm long corolla lobes in function. Coloration of the corolla is extremely variable, with colors ranging from white through yellow, red, scarlet, crimson, violet, greenish, brownish to nearly black. Additional markings, stripes, dots etc., serving as nectar guides, are common. In many species of paleotropical Gesneriaceae two (often raised) yellow lines lead into the corolla mouth. Similar nectar guides are found in neotropical Gesneriaceae with whitish flowers, e.g. Drymonia, Codonanthe, Achimenes, Nautilocalyx. The male floral whorl consists of 5 organs, but usually only 4 or 2 of them are fertile and produce pollen (stamens). The remaining 1 or 3 organs are infertile and usually reduced to small size (staminodes). Rarely, staminodes are lacking completely. In the case of two fertile stamens, the lateral staminodes are usually longer and more elaborate than the median (dorsal) staminode, which is usually a tiny rudiment or even completely aborted. The presence of five stamens is always associated with actinomorphy (radial symmetry) of the corolla, as in Ramonda, Thamnocharis, Bournea (now sunk in Oreocharis, Möller et al. 2011), Tengia (now sunk in Petrocodon, Weber et al. 2011), Conandron, Bellonia, Napeanthus. These flowers are mostly flat-faced (rotate), more rarely campanulate (the erstwhile Bournea) or suburceolate (formerly Tengia). The actinomorphic flowers were previously regarded as primitive, but are now considered to represent a derived condition (Burtt 1970). They (or at least the flat-faced forms) exhibit the general syndrome of oligandric pollen flowers (see Pollination), and one of the reasons why actinomorphic flowers have evolved secondarily in the Gesneriaceae is apparently the switch to buzz-pollination. Reduction of the stamen number to 2 is only known in the paleotropical Gesneriaceae (over 30 genera) and in a single genus of the Coronantheroid Gesneriaceae (Sarmienta), but not in the neotropical Gesneriaceae. It is usually the posterior (upper) pair that is reduced, but there are also some genera in which the anterior stamens are reduced [Opithandra (now in Oreocharis, Möller et al. 2011), Epithema, Sarmienta]. The fertile stamens are divided into a filament and an anther with 4 pollen chambers. In correlation with the corolla type, filament length varies considerably. In the short-tubed and flat flowers, in which the anthers are exposed and form a cone, the filaments are very short. In the long-tubed flowers they are long, sometimes slightly contorted. Insertion of the filaments is mostly at the base, less commonly in the middle and rarely near the mouth of the corolla tube. Filament curving (for correct positioning of the anthers) and coiling (after pollen is shed), is often found when the anthers are coherent. The flat-flowered species of Loxocarpus have conspicuous filament knees that bear a yellow blotch and apparently act as anther/pollen dummies. In many species of Episcieae the filament bases are broad, sheath-like and fused to the dorsally split tube. The tube may provide protection for the superior ovary and channels the proboscis of a pollinator to the nectar, which is siphoned up from the nectary into the space between the corolla and the filament tube. 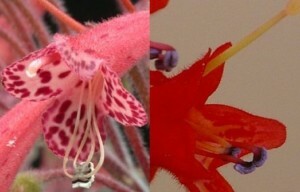 In both Sinningia (l) and Aeschynanthus (r), the anthers are fused in pairs. The anthers exhibit a wide range of forms. Dehiscence is by longitudinal slits or less frequently by an apical or basal pore. Poricidal dehiscence and dry, powdery pollen is indicative of pollen flowers (see Pollination). The anthers are often connate or coherent, either side by side, face to face, or at the apices. This is achieved by interlocking and fusion of the epidermal cells. When 4 stamens are present, the 4 anthers may cohere all together, forming a cross-like structure, or, in case of different lengths of the filaments, they may cohere pairwise. The coherence is of functional importance, especially in flowers with exserted stamens: the cross- or pairwise fusion holds the anthers in a stable position during pollination. Perhaps the most specialized anther configuration is found in a number of species of Drymonia, in which a kind of “salt-shaker mechanism” is present. In the bud the four anthers are grouped coherently around the style, with their thecae facing inwards. As the anthers mature, they become connate along the length of the thecal margins and at their upper end, thus forming a rectangular or columnar unit. The individual thecae open by a short basal slit or pore. Just before opening of the bud, lengthening of the corolla and the filaments, along with the curvature and differential lengths of the filament pairs, causes the anthers to turn upside down so that the pores become located apically. When entering the flower, the insect visitor touches the bottom of the anther unit, which then tips over briefly like a salt-shaker and dusts the visitor with dry pollen. Not all the pollen is shed at once, but several visits are required to empty the anther unit. After the pollen has been shed, the anthers are often removed from the corolla entrance by various filament movements (coiling, retraction, bending down- or upwards).